It’s a student led group facilitated by a counselor or a teacher. Decisions are made by the group and the club was the brain child of Leigh Dunavant, the principal at Godwin who didn’t want to see another teenager die by suicide or overdose. Not that this is a guarantee to insulate a school from disaster but goes a long way in creating a culture where it’s less likely to develop. Mrs. D and a student named April developed this idea and I think it’s brilliant. It took a bit for the club to define itself but from the beginning they met and bonded with one another and the group has grown every year since which is in its third year now. 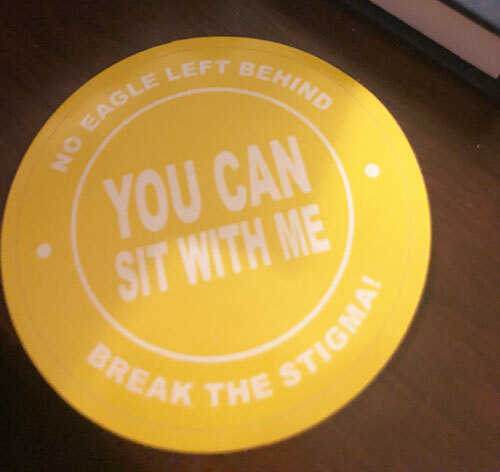 So for the opening day, they have these stickers for notebooks and laptops to welcome students back and make sure people feel included. When I saw it, I broke into tears. An absolute watershed of sadness and ache and I can’t keep from crying as I write this. That one object carried with it the weight of so many memories about my son, Charles. What it says embodies what Charles was about. Letting others know they matter. Truly his greatest gift. Every time a new kid came to school, Charles would invite that teen to sit with him and his friends at lunch, show the new guy around and make him feel welcome. I loved, loved, loved this trait about my son. How he so eagerly reached out to others and made them feel at home when they were petrified of stepping into a new place. I miss this so much I ache and it was so special about my child and why others loved him so much. It’s rare in a world where no one has time for others. It was something I knew about when he was alive because moms would tell me how much they appreciated it. Below, the students from ‘No Eagle Left Behind’ did this bulletin board. 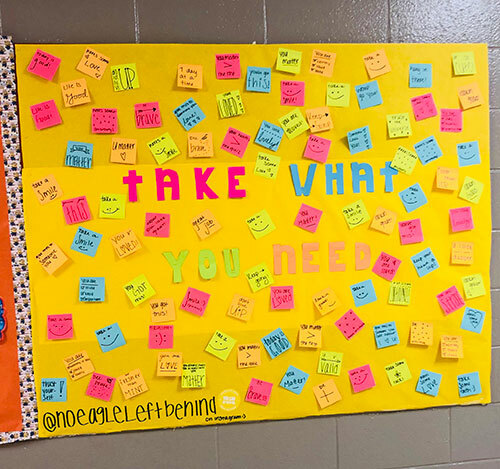 The middle headline says, “Take what you need.” The idea being that students take a post it note with them throughout the day. These students are coming up with ideas on making people feel included making it difficult for a culture of bullying to thrive and empowering students to find ways to facilitate change. And I can tell you from having been at this school multiple times that the atmosphere here is very different from other schools. 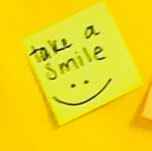 Studies have shown that the school year brings stressors that trigger more suicide in teenagers. So movements like this are important. No school is perfect but creating more connection is a key to creating an environment where suicide, relapse and other high risk and negative coping behaviors is less common. I hope you copy these ideas for your school. It is a wonderful idea but why wait till high school? Kindness, inclusiveness and mental health is important at every age and grade❤️ This idea should be inclusive to all students at every school K-12. I have seen this idea in classrooms throughout Chesterfield which is a great start. I agree Yvette. It needs to start earlier! When I designed these stickers a year ago, I never expected to actually see them come to life. I am so happy to see that they are making an impact. The bulitin board and stickers meant so much to me. Thank you so much for supporting me. When I designed these stickers a year ago, I never expected to actually see them come to life. I am so happy to see that they are making an impact. Thank you so much. The bulitin board and stickers meant so much to me. Thank you so much for supporting me. You are doing great work, April! What an impact you are making at Godwin! This is so amazing and wonderful… What incredible kids (and school faculty/administration)! And they’ve been doing this for three years!